Samsung’s move to jump from the Galaxy Note 5 (review) to the Galaxy Note7 didn’t turn out quite as well as expected, especially since the latter remained a ‘hot topic’ while it lasted. While some tech enthusiasts marked the Note7 fiasco as the end of the Note series, we soon realised this wasn’t the case. In fact, the current flagships from Samsung – the Galaxy S8 and S8 Plus (review), are already among the best Android handsets of the year. And knowing Samsung, it’s bound to come back with a bang and ensure the next Note is going to be an extremely noteworthy device… for all the right reasons. So if you’re like us and are eagerly waiting for the next Note series device, here’s all you can expect the smartphone to offer. Yes, the Galaxy Note8 will miss out on a key identifying part of its predecessor – batteries that spontaneously catch fire. Jokes apart, Samsung is really stepping up its inspection and testing techniques when it comes to its smartphones. So if you thought that the Note8 might carry forward the same flaws of its predecessor, you are most certainly wrong. In fact, on the brighter side, you can now rest assured that because of the Note7 issue, the Note8 would be even safer to use. In fact, even the batteries in the Galaxy S8 duo underwent a rigorous eight-point checklist. The Note8 is expected to be a perfect amalgamation of the design language of the Note7 and the Galaxy S8 duo, featuring a metal and glass sandwich design with curved edges as well as curved sides at the back. Once again, the Korean giant is expected to ship the Note8 with a seemingly bezel-less front, thanks to a 18.5:9 Super AMOLED display measuring 6.3-inches diagonally and coming in at a resolution of QHD+. The display is speculated to come with curved edges and rounded corners, just like the ones on the Galaxy S8. There are a few rumours about a 4K display on the Note8, but those might be a little too far fetched. Including a bezel-less design also means is that the phone will give a miss to the home button, and feature on-screen navigation keys. If you’re wondering where the fingerprint scanner is headed, then the most probable answer is at the back, right alongside the camera. We say probable because earlier reports pointed towards an under-screen fingerprint scanner, but looks like that won’t be ready for full scale manufacturing in time. On the other hand, audiophiles might like the fact that Samsung is not expected to ditch the headphone jack… yet. Every Note device comes equipped with the best hardware available, and we expect nothing different from the Note8. Under the hood, we expect the smartphone to be come with a Snapdragon 835 or Exynos 8895 SoC, with up to 6 gigs of RAM and 128GB of storage. That said, given the smartphone is said to come with microSD card support, Samsung might launch the Note8 in a 4GB / 64GB variant globally, with a 6GB / 128GB variant for select regions. The rumours are spilt when we talk about battery. Some say it will be 3,300mAh unit, while other point to much beefier 4,200mAh battery. Either way, the presence of fast charging and wireless charging is almost a given. Samsung is arguably a little late joining the dual camera bandwagon, but it’s better late than never. In fact, the upcoming Galaxy C10 is supposed to be the brand’s first phone to feature dual cameras. The Galaxy Note8 is also expected to boast the same feature. It will purportedly come with a 12MP primary camera at the back, which will be accompanied by a 13MP telephoto lens to help in portrait shots, as well as for optical zoom. While there isn’t much information about the camera setup, the Note8 is widely expected to come with dual 6P lenses, 5-axis optical image stabilisation and a dual-tone LED flash. On the front, the device is expected to carry forward the same 8MP camera from the Galaxy S8 duo. The Samsung Galaxy Note8 will also play host to a wide array of features including facial recognition, iris scanning, as well as new S-Pen functionalities. The brand is also said to be working on a battery monitoring app for the new Note. Add to that an IP68 rating for dust and water resistance, and the brand’s Bixby voice assistant. 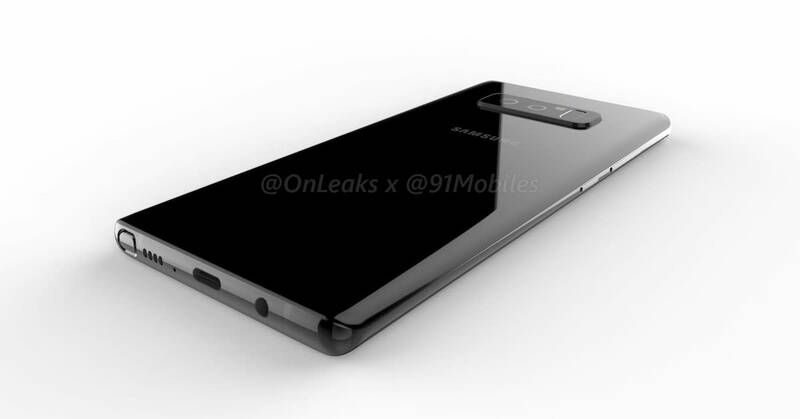 According to the rumour mill, Samsung will be unveiling the Galaxy Note8 on August 23rd, with the phone going on sale soon after. A point worth noting here is that because the smartphone might launch before Android O, the Note8 might still be running Android Nougat at launch. Nonetheless, if this happens to be the case, we expect the smartphone to be updated to Android O soon after the OS debuts in its stable form.